For female digital nomads, having access to community work spaces can feel like a lifeline, especially if that space happens to be The Wing. This all-female, members-only professional club, currently with locations in New York City, Washington, D.C., and San Francisco, not only lets you work in the comforts of a beautifully appointed “office” alongside inspiring professional women, but also offers empowering events, speaker series, and community-building activities. 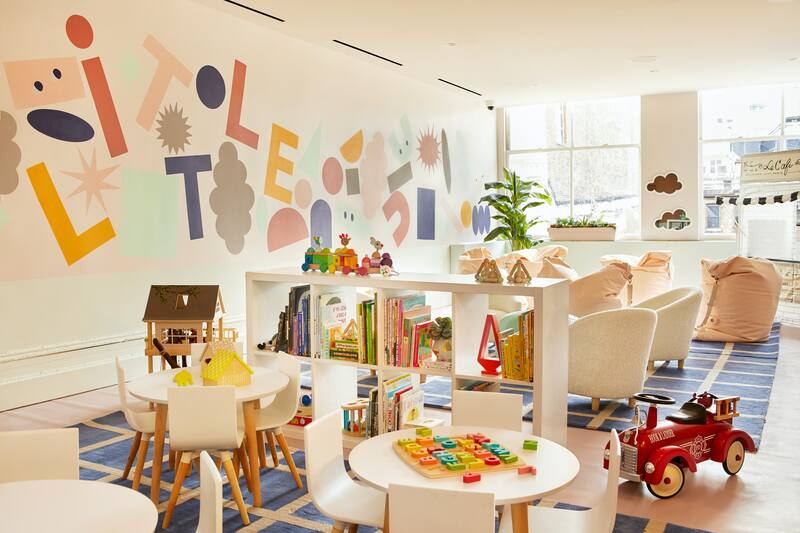 This week, they’re servicing their members in a whole new way with the launch of The Little Wing, a kids’ area complete with babysitting services within their Soho, New York City flagship a real game-changer for career-driven moms. As a working mom myself, I have held both office and remote positions, and it turns out neither are great for childcare. There’s still daycare drop-offs and pick-ups, or the unique challenge of coordinating with, and trusting in, a nanny. I have yearned for there to be a communal work space with quality on-site childcare, but that’s like finding a unicorn. Now The Wing, founded by Audrey Gelman (a former press aide to Hillary Clinton during her 2008 presidential campaign) and Lauren Kassan, is changing that with the launch of The Little Wing. The Little Wing will open its doors on January 30, and will offer childcare services and children’s programming to its Wing members. While The Little Wing will only be located at the flagship SoHo office initially, the company intends to eventually expand the program to their other The Wing locations and hopefully it will set an example for all business about the kind of childcare services that working mothers want and need. According to a company spokesperson, 25 percent of The Wing members are parents, and the majority of those have children under the age of 6, so there was an unmet need for onsite childcare services. The Little Wing seeks to answer that need by offering a variety of childcare options in a gorgeous setting. The soothing, Instagram-friendly play space was designed by The Wing’s in-house design team, Laetitia Gorra and Nicola Kehoe, with furnishings by Crate & Kids. The Little Wing’s babysitters, dubbed Wingsitters, are available for children ages 1 to 6, and are priced at $25 for two hours. Each sitting situation boasts a small Winglet to Wingsitter ratio. There are also weekend ‘Open Play’ hours (9 a.m. to 1 p.m.) priced at just $25 per day, that are available to Wing family members (dads, grandparents, etc.). And since The Wing is known for offering empowering programs to its adult members, The Little Wing will follow suit, offering enrichment classes for its littlest members ($28/class), teaching music and movement, art, yoga, and early literacy development. The Wing members will also have the option to sign up for parenting workshops ($35/class) that will tackle everything from sleep training to returning to work after parental leave, as well as free parenting support groups. While I no longer live in New York, I know that this is exactly the kind of space I would be clambering for if I did live there. And seeing businesses like this, that take into account the needs of a modern working mother, makes me hopeful that more will spring up all around the country.